Openreach, Britain’s digital network business, today called for greater industry and political collaboration to build a large-scale ‘full fibre’ broadband network which would help secure the future competitiveness of the UK for decades and strengthen its position as the leading digital economy in the G20. The business, which provides phone and broadband infrastructure to around 30 million homes and businesses via more than 580 Communications Provider (CP) customers, has launched a consultation with CPs, and is engaging further with government and the regulator Ofcom, to identify whether there’s widespread demand for a large-scale ‘full fibre’ – also known as Fibre-to-the-Premises (FTTP) – network, capable of delivering more reliable service and Gigabit speeds. It will also assess the likely benefits across industry of such a major infrastructure deployment and seek support for the crucial enablers needed to make a commercial investment case viable. Clive Selley, Chief Executive of Openreach said: “We’re determined to continue our investment in the infrastructure Britain needs to support our thriving digital economy and we want to build a much larger full fibre network, so we need to work closely with Communications Providers, government and Ofcom to achieve that. “By using new techniques, we recently halved the cost of delivering ‘full fibre’ infrastructure, but building a large-scale network is still a huge commercial, technical and logistical challenge that’s going to need real ingenuity, flexibility and coordination across government and industry. Full fibre networks are typically more stable, efficient and reliable with customers experiencing fewer faults and more predictable speeds than a hybrid copper and fibre broadband technology. They can also support broadband speeds of up to 1Gbps, which is enough to download an entire HD TV programme in five seconds. However, such networks are also much more expensive and operationally complex to deploy, making the commercial case more challenging. By drawing on the world class R&D teams at our labs in Suffolk, Openreach recently became the first business in the world to demonstrate 100Gbps speeds using its existing FTTP infrastructure, showing the potential such connections have to meet consumer and business demand for decades – even for applications that can’t be anticipated today. 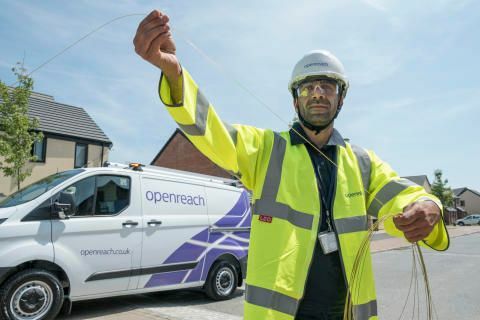 Openreach is already working towards an ambition of making ultrafast speeds of more than 100Mbps available to 12 million homes and businesses by the end of 2020 using a mixture of technologies. However, the business is keen to explore conditions which might allow it to invest in more ‘full fibre’ infrastructure.